Cycle lockers have been installed at the front of the estate and will be available for residents. We are currently waiting to hear back from the council about how keys can be obtained. The central accessway from the front of Hathersage Court to the ground floor flats at the rear of the Estate has now been installed and will soon be made available for those residents. On the quarterly walk-round, we discussed how the sunken playground area can be brought back into use (and is already partly being used). Please contact us if you have any other issues that you would like us to raise or try to address. We are excited to announce that there will be a garden party open to all residents of Hathersage Court taking place on Sunday, 17th August from 12 o’clock onwards in the community garden. There will be an opportunity for residents to learn about the community garden, including how to plant new plants and care for the ones that are already growing. There will be a special gardening/planting session with additional input from professional gardeners. Children are especially welcome to join in. Additionally, residents will have the opportunity to enjoy a BBQ (weather-permitting!) with free food and drink for all. We will also have some additional shelter in case it isn’t so sunny. Finally, it is also time for our biannual general meeting – yes, your TRA has now been in existence for two years in its current format! Come along to learn more about the TRA, share your ideas about improving the estate, and get more involved in your local community! We look forward to seeing you on Sunday, August 17th in the afternoon! 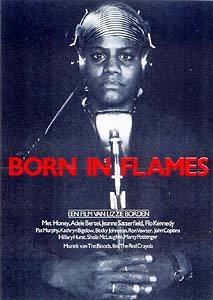 May’s film, Born in Flames, is a 1983 feminist science fiction film by Lizzie Borden that explores intersecting issues of classism, racism, sexism, and heterosexism in the post-revolutionary socialist democracy of the United States. The film presents a group of queer black women who, confronted with the oppression of daily life under the racist heteropatriachy, decide to take their community organizing to the next level by engaging in an armed insurrection against the government. While the film is over 30 years old, issues of party allegiance, racism within feminist organizing, and state repression remain as prevalent today as they did then. The film is a powerful challenge to any revolutionary who believes that sexism,racism, and homophobia will be abolished ‘after the revolution’. Doors 19:00, film starts 19:15. See you there! April’s screening on Sunday 6 April is Slovenian philosopher Slavoj Zizek’s look at how ideology is constructed by the media we consume. From the Catholic underpinnings of the Sound of Music to the fascist political dimensions of Jaws, Zizek (often called the “rockstar” of cultural theory) uses Lacanian psychoanalysis to examine the messages embedded in the films we watch. Zizek is a contraversial and often entertaining character but is always engaging and often thought provoking. Works are now underway on the community garden area. The first phase of works, which involves the creation of two raised beds; planting lavender beds; cherry blossoms, magnolia and apple trees should be completed by April. The second phase, involving a wild rose garden; a wild flower meadow as well as woodland planting and a pergola over the seating area is scheduled to begin in the Spring. Bicycle storage lockers: secure enclosed lockers for bicycle storage to be installed on the ground floor of the estate, in the concrete area facing Newington Green Road. Please watch out for further details on these projects in the coming weeks. Two Czech media students hire an advertising agency to launch a huge campaign for a new hypermarket called “Czech Dream”. The only thing is that the hypermarket does not exist. Czech dream follows the students through the world of carefully-crafted advertising hype as they try to create a media spectacle and open their entirely fictitious hypermarket near Prague just before the Czech Republic joins the EU. Whether you decide that this project is a brilliant hoax that exposes how the rapid transition from communism to a free-market economy has created an ad-addicted, consumer-mad culture in the Czech Republic, or that it’s simply a cruel joke, one thing is undeniable: It’s a fascinating account, formulated and filmed by a pair of young Czech media students, of the way advertising and consumer manipulation can create a market for anything at all, even something that doesn’t exist. Our February screening, on 2 February at 19:00, is the first film to be filmed entirely in Saudi Arabia. Directed by Haifaa al-Mansour, it tells the story of Wadjda, a 10-year old girl who lives in Riyadh in a conservative family. One day Wadjda sees a beautiful green bike that she falls in love with. But her mother won’t allow her to have it, fearing the repurcussions of her daughter owning a bicycle in a society where bikes are viewed as dangerous to a girl’s virtue. So she decides to raise the money herself by various enterprises, and eventually by entering a Koran recital competition. Wadjda doesn’t rest on the accomplishment of being an international first—the film is excellent by any standard. It would be a great film even if it were the fourth film shot in Saudi Arabia or the hundredth. What’s refreshing about the film is it does not try to tell a moral story. Instead, it follows a young girl named Wadjda through her daily life, resulting in an intimate look at the kind of life that’s rarely seen. What better way to recover from yuletide revelry than an evening at OARC watching our January film: Winstanley, which we’ll be showing at 7pm on Sunday, 5 January 2014. The film, made in 1976, follows the Digger settlement telling the story of it’s struggle with the local landlords. It’s beautfully filmed in black and white. As the winter evenings draw in it’s time for another OARC First Sunday Screening and this month it’s a sci-fi classic — Bladerunner. And we’ll have vegan mince pies! The film examines the nature of constructed reality and the relationship between people and machines. Sunday 1 December at OARC. Mince pies from 7pm, main film starts at 7.30pm, strict 10pm finish, adjourning to The Star in Rectory Road for a refreshing beverage and further discussions afterwards. Suggested donation £3, less if you’re skint. See you there! In a cyberpunk vision of the future, man has developed the technology to create replicants, human clones used to serve in the colonies outside Earth but with fixed lifespans. In Los Angeles, 2019, Deckard is a Blade Runner, a cop who specializes in terminating replicants. Originally in retirement, he is forced to re-enter the force when four replicants escape from an off-world colony to Earth. We missed the first Sunday this month. But we’ve got a double bill (and vegan food and discussion!) on the second Sunday instead. We’ll be watching two documentaries about Shell in the Niger Delta, and talking about the issues raised together with an activist from the Niger Delta. On 22nd October, three activists were arrested for the disruption of a Shell recruitment booth in Oxford city centre. They were fined £180 for criminal damage and obstruction of police officers. On the film night there will be a donations pot to raise money to pay the fines. For more info, read their story on Oxford Indymedia. Poison Fire follows a team of local activists as they gather “video testimonies” from communities on the impact of oils spills and gas flaring. We see creeks full of crude oil, devastated mangrove forests, wellheads that has been leaking gas and oil for months. We meet people whose survival is acutely threatened by the loss of farmland, fishing and drinking water and the health hazards of gas flaring. Delta Boys explores the untold stories of the Niger Delta militancy – rebels who band together in the face of corrupt government oppression in this oil-rich region of Nigeria – following the lives of two militants: Ateke Tom, the “Godfather” of the Niger Delta Vigilante Force, and Chima, a 21-year-old who left home to join the fight. The film also documents life in a tiny fishing village caught in the crossfire of the conflict. Mama, a 22-year-old,struggles to give birth to her first child with no access to modern medical care, while raids are launched from a militant camp across the river. The personal stories of Chima, Ateke, and Mama reflect a broader global struggle between entrenched power and corporate interests and an underserved population. There’ll also be awesome vegan food!